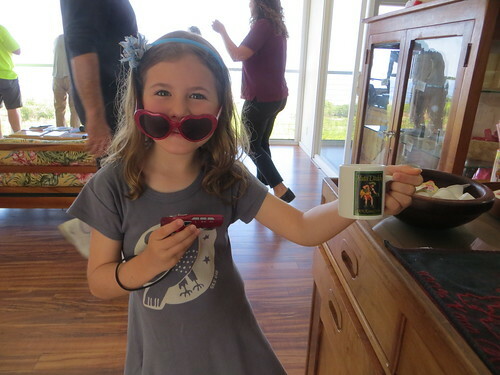 One thing that Tim did last year in Galapagos that Matilda and I were super jealous of was visiting a coffee farm. 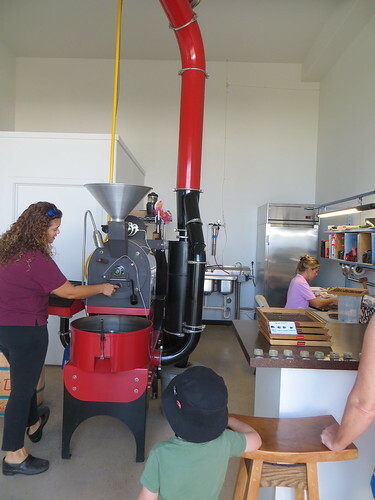 We got our own chance while in Kona on the island of Hawaii, which is renowned for amazing coffee. Matilda is a known coffee fanatic. While I usually restrict her to only a little decaf occasionally, for this rare treat we let her try all the kinds she wanted. As Tim snapped this picture her glasses fell down to hide her beaming smile but you can totally see it in her eyes! 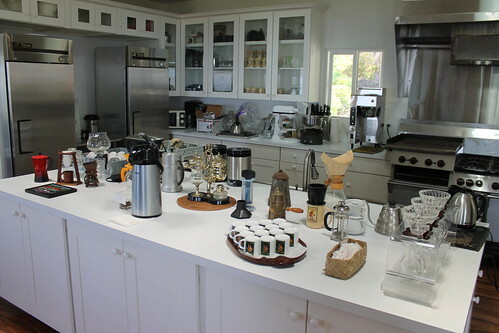 Look at the beautiful tasting kitchen at Hula Daddy Coffee company. Here you can see the coffee beans on the tree. We even were lucky enough to find one red coffee berry that had ripened. Matilda, Porter and I all shared the tiny little thing to get a taste. It was such a fruity unexpected flavor. 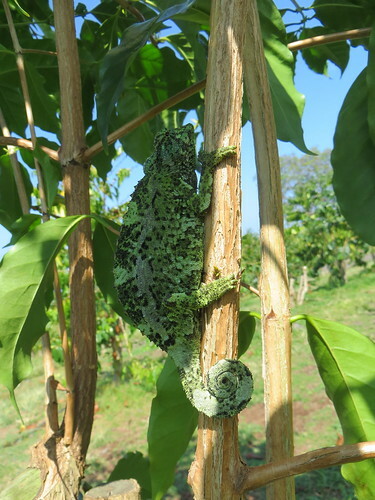 This chameleon provides excellent insect control for the farmers. Even the roaster is pretty looking at this place. We also got to try some tea that the make from the dried fruit which was really yummy. Tim is not a coffee drinker but found he really likes the tea. Matilda did as well, but with triple the caffeine content of coffee I think we will be not be offering that to her! 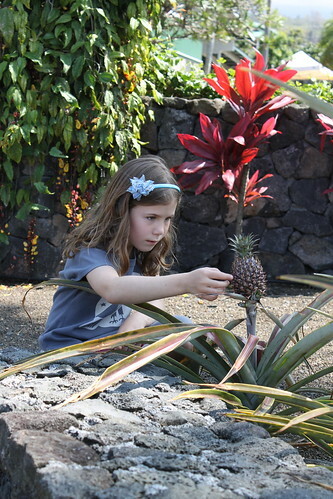 As a bonus, they had a whole bunch of other tropical fruit growing around the property giving the kids their only look at a pineapple growing in Hawaii. Our visit to the coffee farm was super fast as we were headed to the airport to fly over to Kauai. By the time we had returned the rental car and were standing in security, all that crazy strong coffee caught up with me. (I had drank all of my samples and then downed the bottom 2/3s of Matilda's.) For quite a few hours I was feeling so sick and overloaded on caffeine. 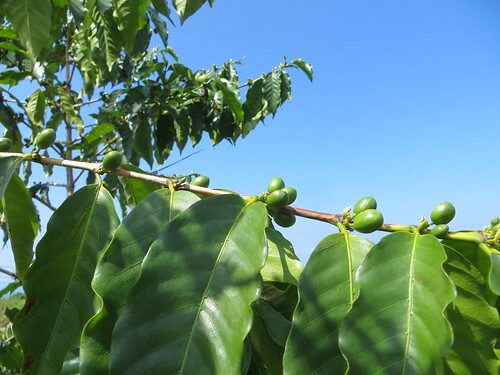 If you ever find yourself in the lucky position of touring a Kona coffee farm, be careful with that all delicious stuff!